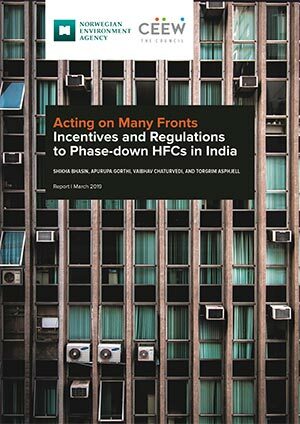 India is set to transition away from hydrofluorocarbons (HFCs) by 2028, in compliance with its commitments under the the Montreal Protocol on Substances that Deplete the Ozone Layer. It has become vital to create and encourage a marketplace for low global warming potential (GWP) refrigerants right now so that they will be widely available by the time India’s transition schedule begins. Early transition to low-GWP refrigerants will also bring associated benefits of climate mitigation and energy-efficiency improvements in some applications. Public procurement can be an important tool in enabling this transition, as it would help bring down the cost of currently expensive technologies that use low-GWP refrigerants. 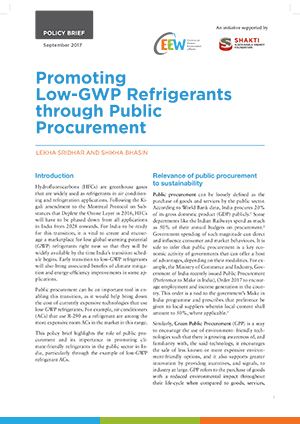 This policy brief highlights the role of public procurement and its importance in promoting climate-friendly refrigerants in the public sector in India, particularly through the example of low-GWP refrigerant ACs. Green Public Procurement (GPP) is a way to encourage the use of environment-friendly technologies such that there is growing awareness of, and familiarity with, the said technology. GPP encourages the sale of less known or more expensive environment-friendly options, and it also supports greater innovation by providing incentives, and signals, to industry at large. Life-cycle cost assessment is considered to be the most thorough method of assessment for GPP. However, it can be technically challenging to implement given the complexities of the multiple tiers of assessment. This brief makes recommendations for climate-friendly procurement policies that may be less technically cumbersome to implement in India. 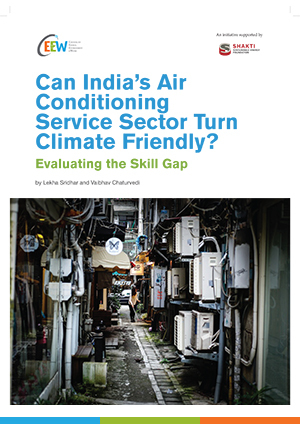 Green Public Procurement can kick-start growth in the low-GWP AC market in India. Specify the type of refrigerant in the system that will be open for bids. For example, all split ACs that are procured could limit the bids to R-32- or R-290-based refrigerants only (that meet the requisite national standards). Specify a maximum GWP level for refrigerants used in the AC system. In such cases, the manufacturer would be free to use any refrigerant or blend as long as it meets the prescribed GWP criteria. Mandate the manufacturer to take back old AC equipment at the end-of-life and ensure that disposal of the equipment includes recovery (and/or destruction) of the refrigerants. Ensure that bid criteria includes good service practices as developed by the Ozone Cell of the Ministry of Environment, Forest and Climate Change, Government of India. Promote a preferential policy for goods that meet environmental criteria. Bids that meet such criteria would be favoured above the lowest bids, within a margin of 10- 20% of the lowest bid amount. Green Public Procurement can kick-start growth in the low-GWP AC market. While there are important issues to consider like the additional cost to the exchequer or the relative unpreparedness of the vendors in complying with such policies, the benefits that India stands to gain are immense. Apart from the climate-change and energy-efficiency benefits, such a programme could also drive innovation in green technologies.